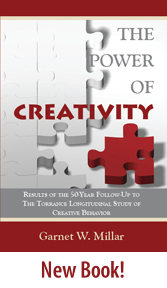 Torrance Tests of Creative Thinking (TTCT) – Scholastic Testing Service, Inc.
We welcome and encourage comments from educators who have something to share about the recent Newsweek article, The Creativity Crisis. Comments are moderated by our editorial staff and will be published soon after you submit. Be sure to include links to related sites. View the recently published Newsweek article, “The Creativity Crisis” to read how authors Po Bronson and Ashley Merryman ask and answer this question.